Noto Sans CJK Medium font family series mainly provide Regular and other font styles. Noto Sans CJK KR Medium font family series mainly provide Regular and other font styles. 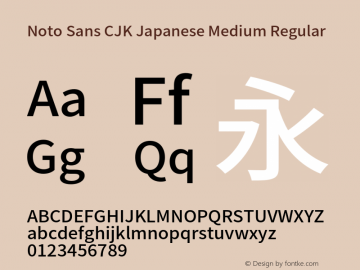 Noto Sans CJK JP Medium font family series mainly provide Regular and other font styles. Noto Sans CJK SC Medium font family series mainly provide Regular and other font styles. Noto Sans CJK TC Medium font family series mainly provide Regular and other font styles. Noto Sans CJK Japanese Medium font family series mainly provide Regular and other font styles. Noto Sans CJK Korean Medium font family series mainly provide Regular and other font styles. Noto Sans CJK Simplified Chinese Medium font family series mainly provide Regular and other font styles. Noto Sans CJK Traditional Chinese Medium font family series mainly provide Regular and other font styles.